Reflectix Insulation has over 20 energy-saving applications for around the home. The list of uses includes crawl space, radiant floor, attic and walls. Our product is easy to handle and install. Reflectix requires only basic tools: A stapler, tape measure, utility knife, straight edge and safety glasses. Since our insulation is fibre free, no protective garments or respirators are required. Reflectix warrants materials and our workmanship to perform as claimed under normal conditions and when installed or utilized in such a manner as to be in accordance with instructions detailed in Reflectix Installation guides. For any questions, contact our Customer Service # 800-879-3645. Owens Corning EcoTouch QuietZone PINK FIBERGLAS Acoustic Insulation - 16 Inch x 48 Inch x 2.5 Inch; 170.7 sq. Feet. Want more peace and quiet? Help reduce unwanted noise in the bedroom, bathroom, basement, home office or theatre with EcoTouch<sup></sup> QuietZone<sup></sup> PINK FIBERGLAS<sup></sup> Acoustic Insulation. Install QuietZone<sup></sup> PINK FIBERGLAS<sup></sup> Acoustic Insulation between framing of interior walls, floors and ceilings. EcoTouch<sup></sup> PINK FIBERGLAS<sup></sup> Acoustic Insulation offers outstanding noise control solutions for every project in your home. FOAMULAR Extruded Polystyrene Rigid Insulation is made in Canada and offers a combination of characteristics that result in long-term thermal performance of R-5 per inch, compressive strengths of 20 100 PSI and exceptional moisture resistance. Using FOAMULAR insulation can create comfortable living spaces in basements, as well as minimizing heat loss or gain when using it on above-grade exterior walls and the interior of foundation walls. FOAMULAR Extruded Polystyrene Rigid Insulation is lightweight and durable making it easy to handle, saw, cut and score. Phifer TuffScreen is a heavy-duty, tear resistant insect screen. TuffScreen is three times stronger than regular insect screen. Ideal for areas exposed to heavy wear or potential damage. 48-inch x 25 ft. 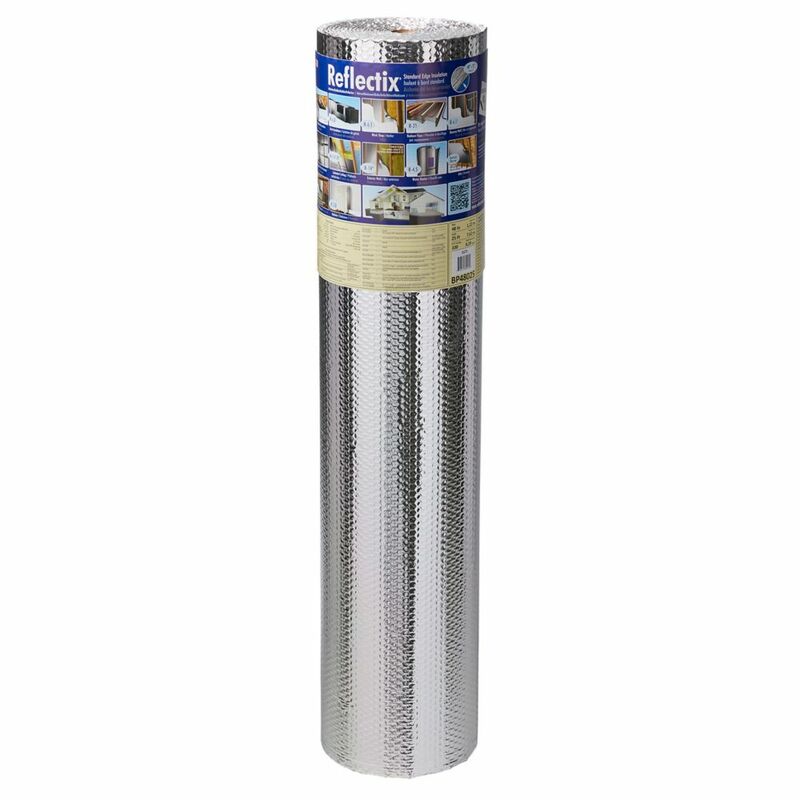 Double Reflective Insulation Reflectix Insulation has over 20 energy-saving applications for around the home. The list of uses includes crawl space, radiant floor, attic and walls. Our product is easy to handle and install. Reflectix requires only basic tools: A stapler, tape measure, utility knife, straight edge and safety glasses. Since our insulation is fibre free, no protective garments or respirators are required. 48-inch x 25 ft. Double Reflective Insulation is rated 4.7 out of 5 by 40. Rated 5 out of 5 by Ds from Bunk end on hybrid trailer Works great for bunk end on my hybrid trailer. Huge difference with AC running. Rated 5 out of 5 by AL G from Great product. Great product, doesnt seem available at all Homedepots, and it is a little pricy. Rated 5 out of 5 by Anonymous from Easy and works great! The reflective insulation was excellent to work with, had no fiberglass, went on easy and worked fine. We used the insulation in knee wall areas. We took readings on the wall before and after with an electronic infrared thermometer to prove it made a difference. It made a definite difference in that room which is 45 feet long by 14 feet wide. We were pleased with the results. Rated 4 out of 5 by beginner from Works great, easy to work with and put up Had no problems cutting and putting it up on the garage doors, need something to hold in place. Don't use gorilla glue. Covered two single doors with ease. Rated 5 out of 5 by Anonymous from reflective insulation a great value have to use a sticky spray on glue foam, but worked very well with my quonset metal style maintenance building on our farm. Rated 4 out of 5 by Rick from Good product for insulating in tight spaces. Doing a knee wall insulation upgrade using this product to seal the fiberglass batt insulation on the cold side of the knee wall. It seems to have stopped or slowed air movement between the cold and warm side. It remains to be seen how it will perform in the summer heat. It is easy to use this product in tight, confined spaces and seems to be doing the job of reflecting heat back into the living space. Rated 4 out of 5 by marc from cheap This is the first time I used this insulation. Seems to work well. Easy to install. Rated 4 out of 5 by ExCoastie from Good product Good product, used to cover water heater! Followed instructions and worked well. You will need silver reflective insulation/duct tape to seal and hold product. Can this product be installed on the warm side over the vapour barrier and under the finishing product with the same r value achieved as an exterior application?